For a short time only, the Everhart will explore the traditions of ancient Andean culture. 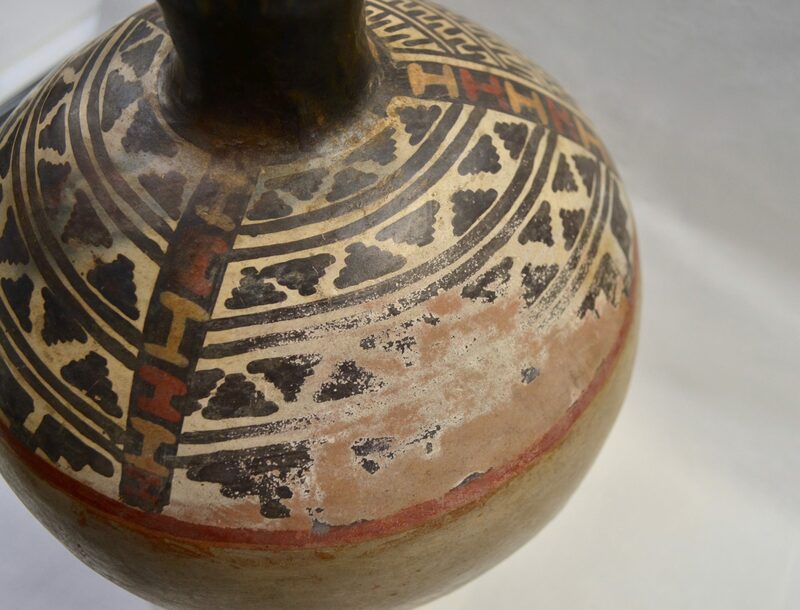 Textiles, pottery, and other South American artifacts from the Museum’s collection will be used to discuss the science of preservation and how artifacts like these have found their way to the Everhart. This exhibition will allow you to see how Andean traditions have evolved and how some practices are continued today by living indigenous communities. Called a Neo-Expressionist, Hunt Slonem combines Abstract Expressionist techniques with mysticism and is best known for his paintings of tropical birds and bunnies. He uses an abstract platform for his traditional subject matter, developed with gestured brushwork and bold Warholesque repetitive compositions. This exhibition highlights a series of works that were created early in his career and informed by his time spent in Cholula, Mexico while attending the Universidad de las Americas. 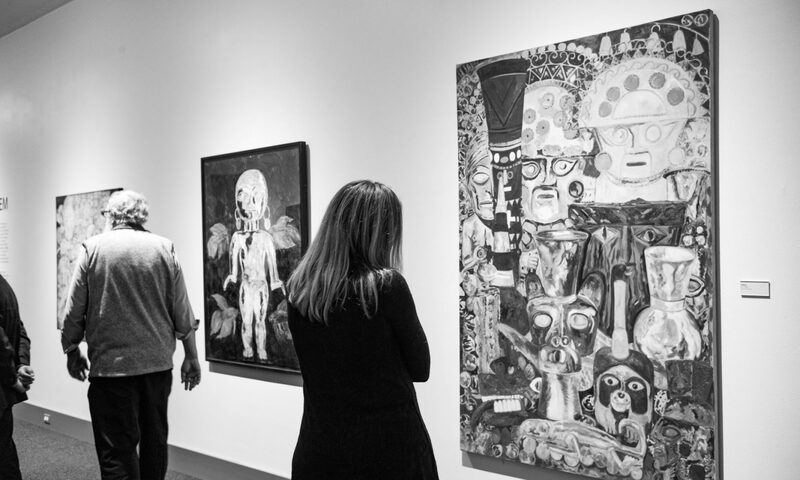 The vibrant large-scale paintings produced between 1978 – 1986 are a reflection of the time spent exploring ancient Aztec archeological sites. ABOUT THE ARTIST Born in Kittery, Maine, in 1951, New York-based artist Hunt Slonem is an American painter, sculptor, and printmaker. Considered one of the great colorists of his time. Slonem studied painting at the Skowhegan School of Painting & Sculpture, Vanderbilt University, and Tulane University. His work has been the focus of over 300 solo exhibitions worldwide and is held in the collections of more than 100 museums, including the Metropolitan Museum of Art, the Whitney Museum of American Art, and the Solomon R. Guggenheim Museum. An accomplished designer, decorator, and restorer of homes, Slonem’s work on these transcendent and colorful spaces has been featured in House Beautiful, Architectural Digest, and The New York Times. American Visionary: John F. Kennedy’s Life and Times is presented by the Everhart Museum and Wiener Schiller Productions in cooperation with the John F. Kennedy Library and Foundation. Generous support for the exhibition is provided by the Governance Institute and the Blanche and Irving Laurie Foundation. Additional support provided by Stephen Kennedy Smith and Getty Images. Kathleen Elliot creates intricate plant-inspired plant sculptures, such as imaginary botanicals of flameworked glass. Leaves, fruit, seed pods and flowers are reimagined in new varieties of organic life. Natural forms appear in unexpected colors and in fantastic, new combinations. Through this process, the vocabulary of observed botany becomes a vehicle for personal expression. Exhibition organized by Katharine T. Carter & Associates. In coordination with the 8th International Conference of Contemporary Cast Iron, the Everhart is pleased to present New Frontiers. Considering the conference theme, “Post Industrial Iron: Divergence, Dialog, and New Directions”, this juried exhibition emphasizes the idea of time, travel, movement, place, space, and connections. Featuring work by Kevin Dartt, Naomi Campbell, Frank DePalma, Alex Grabiec, Paul Higham, Stacey Holloway, Rian Kerrane, Lauren Koch, Coral Penelope Lambert, William Prtune, Andre Rubin, Woody Stauffer, and Michael Richard Thron. PARK BENCH STORIES features the artwork of Leni Levenson Wiener, who captures people in various situations, all while sitting on park benches. Her unique fabric collages express the nuances of human interactions, from checking smartphones to meditative contemplation. MAKING FACES is a retrospective of drawings and paintings by caricature artist John Kascht, whose irreverent work turns the leisurely pastime of people-watching into an Xtreme sport. Over a 30 year career as an illustrator, Kascht has created work for album covers, theater posters, gallery collections, and most major publications. MAKING FACES features portraits of historical and contemporary notables, and includes subjects of interest to political junkies, moviegoers, music lovers, history buffs, artists and even people who hate art shows. In addition to entertainment, the show delivers thought-provoking glimpses into the serious intent behind the funny pictures. Visitors to the show are sure to leave smiling and it’s likely they won’t look at faces – or the mirror – the same way again.